Halifax could be one of the first municipalities in Canada to produce an annual report on pedestrian safety. That’s one of the recommendations the municipality’s Crosswalk Safety Advisory Committee might include in its report to be finalized Jan. 30. “The biggest problem that we faced six-seven months ago was the lack of data. Not only here, but in other municipalities,” said Coun. Barry Dalrymple (Waverley-Fall River-Musquodoboit) after the committee meeting adjourned today. This reporting and accident evaluation would help Halifax improve pedestrian safety and create data in an area where only minimal research has been previously done. Other proposals included zebra-striped crosswalks, patrol cars stationed near crosswalks, continued research towards educational initiatives and additional marketing of the municipality’s Distraction Kills public education campaign. “The Distraction Kills campaign is controversial,” said Dalrymple, of the public service commercial that features an inattentive driver approaching a pedestrian, who is crossing the street while texting. Although most of the advisory committee’s ideas are geared toward preventing accidents from the driver’s end, Stephanie Conrod, a student at Dalhousie, feels pedestrians should take more responsibility. 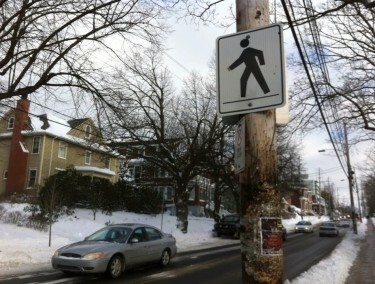 “People should not be allowed to be on their cellphone if they are walking across the street, it’s so bad,” said Conrod. However, she acknowledges it’s difficult to regulate pedestrians being distracted. She also agrees there are ways to improve visibility for drivers. The committee’s recommendation report will be finalized next week, so returning students could arrive in Halifax to safer crosswalks.